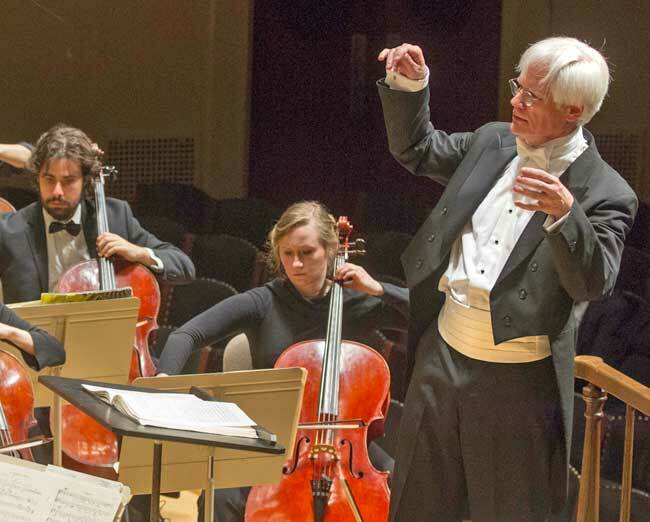 The Boston University Symphony Orchestra performs once a year at Symphony Hall, which they did on Monday night, April 2, a day when the other orchestra that customarily uses that venue was taking a day off. 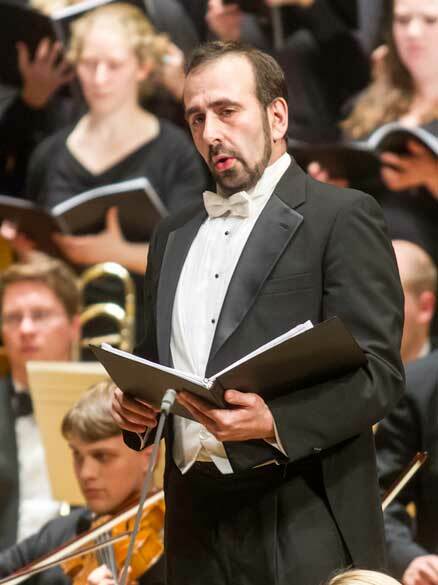 Together with BU’s Symphonic Chorus, the BUSO, under conductor David Hoose, presented a whopper of a program, comprising Rachmaninov’s The Bells, op. 35, and Shostakovich’s Symphony No. 11 in G minor, op. 103, and thoroughly justified using the exalted venue, though they far from filled it. As an appetizer for the hefty meal to follow, the BU School of Music dispatched Prof. Patrick Wood Uribe to walk the rather scant pre-concert audience through the background of the pieces. For the Rachmaninov, he discussed the setting of the text, which was Konstantin Balmont’s (shall we say) rhapsodic interpretation of the classic Edgar Allan Poe poem. The history of Rachmaninov’s engagement on the work is rather entertaining: it transpired that a female fan of his, a cello student of one of Rachmaninov’s students, found the Balmont work and sent Rachmaninov a gushing but anonymous letter enclosing the poem and urging him to write a piece based on it. Rachmaninov, who had always had a fascination with bells, seized on the suggestion. There is no evidence that he ever read, in the original or in translation, Poe’s actual poem. That is why it seemed odd to us that when Wood Uribe (a double barrel, apparently, like Vaughan Williams) illustrated his points with quotations from Poe rather than the English translation of Balmont by Keith Langston, of the University of (US) Georgia, printed in the program book. For the Shostakovich, Wood Uribe provided a sonic Baedeker to the many found-object tunes from which the symphony was constructed — a very useful exercise indeed for us non-Russians unfamiliar with the sources. Less helpfully, he approached the always-thorny questions concerning the “real” meaning of the music with a rather wishy-washy “some say-others say” dichotomy that provides tacit validation for a “Shostakovich as apparatchik” reading that, in these ostensibly learned precincts, ought to be as stomped-upon as Creationism in the public schools. Before leaving the lecture, we should mention that, apropos of some commentary here in BMInt blogs concerning Symphony Hall’s pylon-shaped portable speaker system: we got our first opportunity to hear it in action. The results were appalling, whether owing to the quality of the speakers, the positioning of the microphones, the nose-in-the-text posture and general lack of projection by the (human) speaker, or the effect of a sparsely-filled hall, we don’t know. We found the only way to gather in any intelligible sound was to cup our ears, and this from a pretty prime location in the front center section of the hall. Back to the drawing board! Neither of the works on the program is what one would call standard rep for the respective composers. The BSO performed The Bells in 1979, and Boston hasn’t heard it since (disclaimer: we get these stats from the BUSO publicity materials and have no ready means to verify them), and Shostakovich No. 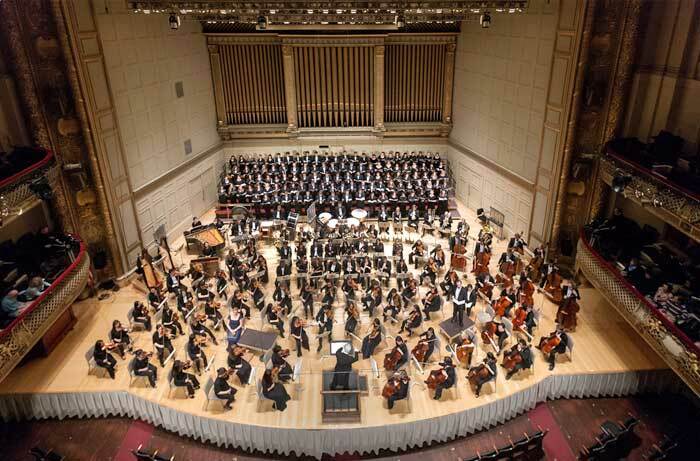 11 was, if not a Boston premiere, the debut performance in Symphony Hall. Our seatmate allowed as how he had heard it at least twice in London, with major orchestras, so evidently Boston has some catching up to do. Rachmaninov thought highly of his op. 35, dating from 1913, which he variously referred to as his Symphony No. 3 (before he wrote the one he officially called that), a choral symphony, or a cantata. It is in four movements, corresponding to the standard symphonic layout, as well as the general progression of the poem. Balmont’s goal, apparently, was to render in Russian the ingenious (or, if you are Ralph Waldo Emerson, egregious) sound effects Poe produced in English, corresponding to the size and construction of the bells depicted, and the moods of the various “chapters” of the poem. As a consequence, the actual meaning of Poe’s text was subordinated, and in evaluating Rachmaninov’s setting it is important to understand that it is Balmont’s, not Poe’s, work that the composer set. One curiosity to us is that Wood Uribe never mentioned the fact that each stanza gave a different substance and visual color to the bells: silver for the sleigh bells, gold for the wedding bells, bronze for the fire bells, and iron for the funeral bells; the effect of color and material on the actual sound, and the composer’s imagination of the sound, must have been considerable. In any event, on this redirection of the text Rachmaninov overlaid his own interpretive attitude, so that for example the second movement, about wedding bells, had a much more solemn tone than either Poe or Balmont gave it. The work itself, as noted earlier, is in four movements, a light-toned sleigh ride, in which much of the vocal action is carried by the tenor solo, Yeghishe Manucharyan. His strong, projecting voice, firm resonant tone and excellent diction — at least to the extent a non-Russian speaker can tell — were wholly admirable. One nice touch of scoring was the use of a humming chorus in parts of the movement, the idea for which, Hoose’s program note suggests, Rachmaninov might have picked up from Puccini during the stay in Italy when Rachmaninov began writing the work. Hoose did something unusual with his soloists, by the way: instead of positioning them in a row in front of or alongside the conductor, they sat in the orchestra and stood up on benches to perform; it worked rather well. For his part, Hoose kept commendable charge of maintaining orchestral, solo, and choral balances and paced the music well, especially noticeable in nice descents from climactic moments. 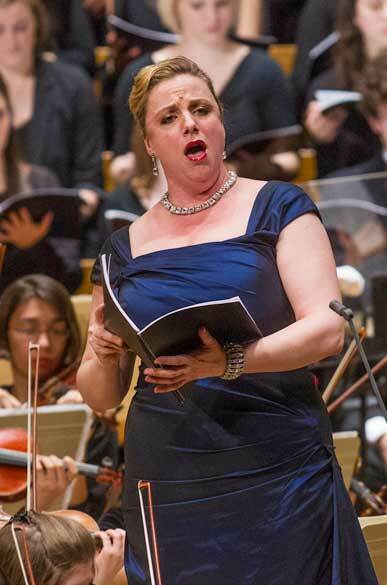 The second movement, featuring soprano Janna Baty, whose tone and projection were also excellent but who subordinated diction to color, gave most of the larger musical argument to the orchestra, with the soloist offering mostly color commentary, except for a lovely lyrical coda. There were no big Rachmaninov tunes in this work, it must be admitted. Balance here got a little off track, as the cellos were occasionally subsumed. The “scherzo” movement, in which the chorus had all the vocal part, was about as wild a ride as Rachmaninov permitted himself, and was for us the musical highlight of the piece, with irregular accents and moments of careening hysteria and chromatic slides that in some ways foreshadow some of Shostakovich’s lunatic-asylum scherzos. One should mention at this point that Rachmaninov threaded the Dies Irae plainsong that was such a staple with him throughout the entire work; it became most prominent in this movement (oddly, since the finale was funereal), in this case rhythmically altered. One wishes that the composer had indulged the wild ride even more than he did; there were numerous places of relative musical repose, but Hoose kept the pace and volume at tooth-rattling intensity as much as possible. Throughout, the chorus was fully engaged, fully together, and sounding splendid. The finale presented a few issues of interpretation, both Rachmaninov’s and Hoose’s. On the composer’s side (abetted by Balmont) the funereal conclusion to the poem’s (as life’s) progression is mitigated at the end by a shift to major mode to describe “the peace of the grave” — something totally absent from Poe. (Peace and repose, even in death, were not his long suit.) It’s a lovely moment, the transition to which Hoose managed quite skillfully, but it might have been better had he been more faithful to the lento lugubre tempo marking for the movement. As the soloist, baritone Anton Belov provided the solid and mellifluous genuine Russian sound and some evidently perfect diction — it could only have been better had the part called for Chaliapin-like depths. It is a somewhat unusual circumstance for a Rachmaninov work, but the overall orchestral sound of The Bells is so well blended that despite the composer’s customary brilliance of orchestration, there were seldom occasions in this piece where individual instruments or sections achieve prominence. In the finale, though, we can commend the gorgeous English horn solo of Kai-Chien Wang and the rich and pure sound of principal horn Parker Nelson. Readers, if you’ve gotten this far, we thank you. It was a very long program and, because of the lecture and the fact that the works on the program are unfamiliar to local audiences, if you haven’t guessed it already, this is going to be a long report. The Rachmaninov ran on a bit over a half hour; the Shostakovich symphony that followed, subtitled The Year 1905, is in four attached movements that added up to over an hour’s worth of unbroken music. We’re not complaining, though, as it is one of this greatest of Soviet composers’ simultaneously most accessible and most mysterious works. Begun in 1955 in honor of the 50th anniversary of the so-called January Revolution or, more pertinently, “Bloody Sunday,” when unarmed protesters seeking to petition the Tsar were pitilessly gunned down by the Cossacks guarding the (as it happened) unoccupied royal palace in St. Petersburg. Shostakovich didn’t complete the work, however, until 1957, by which time it had become the 40th anniversary of the revolution that installed the Communists, who were looking for a bit of revolutionary bombast that might sweep some of the Stalinist dirt under the patriotic and proletarian rug. Meanwhile, 1956 had presented its own piece of revolutionary history in the form of the Soviet suppression of the Hungarian popular uprising. Against this background, Shostakovich did what he had become practiced at: producing work that purports to be one thing but leaves the strong impression that it was really something else. To achieve these ends, he did things that were quite unusual for him in an “abstract” symphony: he created a work with a clearly stated dramatic and pictorial program in a readily accessible harmonic idiom. It was based entirely on “found” melodic materials, almost entirely 19th-century Russian revolutionary songs that would resonate with the Russian audiences of 1957 (the remainder were chiefly the composer’s own tunes setting pre-Soviet revolutionary texts). This procedure resulted in a work that on its surface was the very model of a modern Socialist-Realist symphony, and indeed many in the Soviet musical world, whether they were delighted or appalled, took it as such. But was Shostakovich ever that simple? Both his biographer Solomon Volkov and Shostakovich’s son-in-law reported comments from the composer that he was thinking of the idea of recurrence: how time and again a people would rise in supplication and be brutally beaten into the ground by ruthless tyrants. Shostakovich did not live to know of the events in Tiananmen Square, but he would certainly have recognized the M.O. The music of his 11th Symphony contains much that is stunningly striking, beginning instantly with the icy stillness of Palace Square (these events happened in January) the night before the great massacre. The seething resentments of a subjugated people are conveyed quietly as the tune “Listen!” is played and developed against the distant sound of a military encampment. Hoose and the orchestra maintained the eerie foreboding throughout, with the old revolutionary songs wafting like ghosts. Special praise is due to the percussion, much used in this work, and to principal timpanist Catherine Varvara; has any composer used timpani as a melody instrument as Shostakovich has? The second movement, the “main event” as it were, saw impeccable pacing to the climaxes, though here Hoose was often seen exhorting the violins to put out more sound. There is some fearsomely active passagework for cellos and basses, both at the beginning of this movement signaling the protest, and then in its second half, depicting the actual slaughter, which were superbly played. As you may imagine, the second half of this 20-minute-long movement brought forth massive volumes of sound, all perfectly executed, and then even better executed when suddenly reverting to the post-carnage hush to which the first movement’s music returns. Just as the first movement bears a certain family resemblance to the ice music from Prokofiev’s Alexander Nevsky, the third movement’s long-breathed dirge conjures the comparable bury-the-dead scene from that score. Shostakovich, though, does this in a far more epic and extended way, not with any “formalist” technique like a fugue, but with a gradual exfoliation throughout the orchestra (praise here to the violas, who perfectly carried the initial burden of the long line). The central section of the movement built to a noble, yet angry and insistent throbbing; the anger that permeates the entire symphony got its best expression in these restrained but passionate utterances. The finale presented Shostakovich with his trickiest problem: how to create a convincingly heroic apotheosis without seeming to congratulate the Soviet inheritors of the tsars’ cruel proclivities. Just as in his also populist-sounding fifth symphony, where he achieved this effect with an incongruous tempo, here he did it with incongruous harmonic devices. Throughout the movement, Shostakovich has rescued the music from empty rhetoric with cutting harmonies and sheer vehemence (thank you, David Hoose); at the end, he sets up an unresolved conflict between G minor and G major, as the return of the first movement’s music reminds everyone that for the Russians it’s always the day before the massacre. The tonal ambiguity is left hanging at the end in the reverberation of the bells, as the orchestra pounds a single unharmonized G.
Both the Rachmaninov and Shostakovich works should get more performances, especially the latter, whose greatness the poet Anna Akhmatova acknowledged even amid the cries of betrayal from the rest of the chattering classes. The level of performance by the BUSO and the chorus, whose conductor Ann Howard Jones received deserved cheers after The Bells, was up to the highest standards and, as we said, fully worthy of the venue in which it was presented. Photographer Michael J. Lutch from lofty perspective. *I am not sure what Mr. Koven meant altogether at the end of the second paragraph of this review, since it is not a complete sentence, but he seems to be mistaken about the translation. I just watched the virtual concert hall lecture on the BU website, and Professor Wood Uribe (his two surnames are standard in Latin American cultures, as in Garcia Marquez and Vargas Llosa, both Nobel Laureates) illustrated his points with slides showing Fanny S. Copeland’s translation of Balmont’s poem. Copeland’s is the translation that is used in the score. Wood Uribe did quote Poe once, and did show one slide of Poe’s manuscript. Mr. Koven also goes on to write that Professor Wood Uribe never talked about each bell’s color and quality, but Professor Wood Uribe actually did. Yikes.